A Foodie's Guide to Hong Kong's Best Cheap & Good Eats — Blake Erik. Hong Kong is a busy harbour city notoriously known for it’s crowded streets, towering skyscrapers, cramped apartments and a buzzing nightlife scene both catered more to locals (Mongkok) and foreigners (Lan Kwai Fong). With more than 7 million people living and working in the city, unsurprisingly, some of the best Cantonese cuisine can be found in this metropolis. This guide is a guide to the best cheap eats in Hong Kong, with prices starting from HKD30 (roughly USD3.80) to HKD100 (≈USD12). From my trip to Hong Kong, I've turned some of my photography into my brand of everyday products which you can check out below. 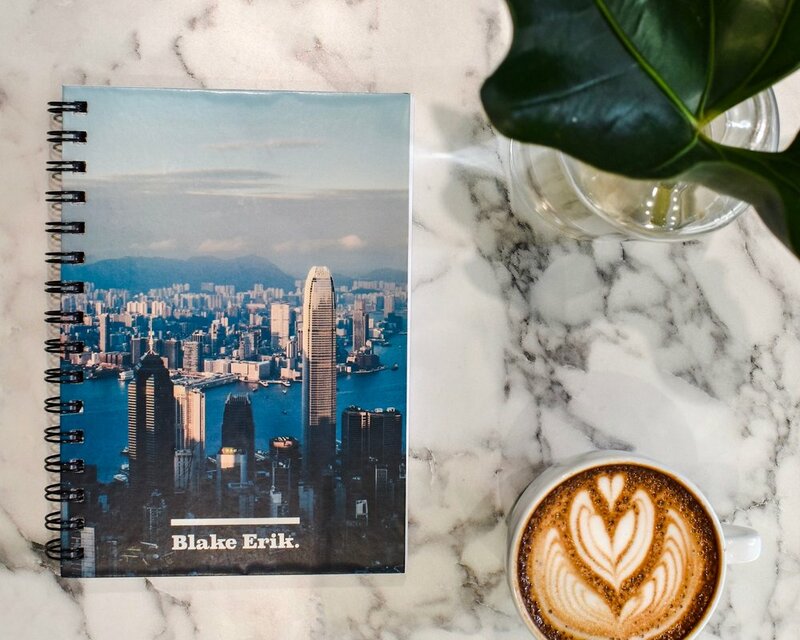 Worldwide shipping is available so if you're looking for a notebook with dot grid, blank or ruled pages to take home to remember your travels if you too have been to these parts of Hong Kong, or for some travel inspiration! Mak Man Kee is a very local establishment in Kowloon, a short walk away from Jordan MTR station. It is located on a street right next to Australia Dairy Farm, which is by and far away the most popular local Cha Chaan Teng (茶餐廳) institution for your Hong Kong-style fast food tea cafes. We arrived on a Saturday and Mak Man Kee was packed out, with a short queue in front of the shop, though nowhere near as long as Australia Dairy Farm next door. Mak Man Kee is incredibly popular with locals, which means service is quick, often considered abrupt, and servers can barely speak English. Expect to have to share tables with other diners, especially when it’s crowded. Apart from the English menu if you ask for it, the menu can be found on the walls written in the traditional Chinese script, and the specialty here is the Wonton Noodles of course, and the Beef Brisket Noodles. A bowl of Wonton Noodles starts at HKD34, which is ridiculously good value for money. The bowl of noodles might be physically small and a little underwhelming at first, but the portion of noodles and dumplings is about the same as you’d get anywhere else for a similar price. Originating from Guangzhou, China, Mak’s Noodle was founded by Mak Woon Chi and started Mak’s Noodles’ first stall in Central, Hong Kong. Mak’s Noodles has now expanded to a chain of outlets around Hong Kong, including branches in The Peak, Tsim Sha Tsui, Jordan, Causeway Bay etc. Mak’s Noodles has even made it’s way overseas, including a store in Singapore’s very own Orchard Road. We went to the original stall in Central along Wellington Street, and it was surprisingly uncrowded and we got a table easily. I got a bowl of Beef Brisket Noodles for HKD46, which was likewise a small bowl, but the reason behind it is that in Cantonese cuisine, noodles are meant to be a snack and not a main course, and the small serving bowls are supposed to prevent the noodles from going soggy. Perhaps a little kitschy and touristy, you can see chefs preparing bowl after bowl behind a glass window which was interesting to watch. The bowl of noodles here was great as well, and the beef brisket was really tender too. Tsim Chai Kee Noodle Shop is just across the street from Mak’s Noodles, and the two are considered rivals on the same street. Featured in Michelin Guides of the city, Tsim Chai Kee has occupied a stall on Wellington Street since 1998. Mak Man Kee may still be the most local and humble establishment out of the three noodle shops I’m mentioning in this guide, and Tsim Chai Kee lands somewhere in the middle compared to Mak’s Noodles which felt slightly more upscale. Tsim Chai Kee was crowded too and there was a queue outside it’s doors during lunch time on a weekend. But, like many other Hong Kong establishments, the eating culture being eat your food and go (ie. you’re not allowed to sit and hang around in the restaurant after having your food, expect to be chased out if you do), means the wait for noodles never gets too long. I opted for the popular Wonton Noodles here and I thought these noodles were just as good as Mak Man Kee. Portions as well as serving bowls here are bigger and even slightly cheaper at HKD32, though I thought the dumplings at Mak Man Kee were a little more flavourful. Dim sum is possibly the most ubiquitous meal you can have in Hong Kong, and there are many dim sum chains in Hong Kong, Dim Dim Sum being one of them. Dim sum is slightly more expensive than the aforementioned bowls of noodles but is likely to be more filling, not to mention the plus side of sharing dishes. Many of the Dim Dim Sum outlets open till about midnight or 1 in the morning, which makes for great late night food. Dim sum is something that can be enjoyed at all times of day, and often with Chinese tea, and depending on where you are, different Dim Dim Sum outlets feel more local because of the crowd. We went to the one in Jordan late one night and you can expect good quality dim sum dishes for a reasonable amount of money, and is a lively place to kick back and enjoy good food with a group of friends. For a number of dishes between the two of us, we paid HKD64 each. A popular haunt in Sheung Wan next to Central and SoHo, Dim Sum Square is located on the corner of Jervois Street. Because of its proximity to Central where many offices are, Dim Sum Square is very popular with both the working crowd as well as tourists. Don’t take that as a bad thing or an indication of a tourist trap though, Dim Sum Square is a great place too and is often very crowded. Make sure you try the BBQ Pork Buns which was crispy on the outside and piping hot on the inside, and the way it melts in your mouth is incredible. One of the most famous dim sum restaurants in Hong Kong is Tim Ho Wan, another chain of dim sum restaurants which has been awarded a Michelin star with humble prices to beat. Tim Ho Wan has even found a market overseas from New York to Singapore to Sydney. Started in 2009, Tim Ho Wan quickly gained international recognition by 2010 with the help of the Michelin Guides, and these days Tim Ho Wan is as popular amongst locals as it is with foreigners. Tim Ho Wan has opened outlets all over Hong Kong, but unlike Dim Dim Sum, Tim Ho Wan’s outlets often close at around 9:30pm to 10pm, keeping to more regular meal times. Specialties include the pork buns, vermicelli roll with pig’s liver and pan fried carrot cake. The glutinous lotus leaf rice was a lot bigger than some of the other places we had it, and we were completely stuffed by the end for HKD67 each. The original Tim Ho Wan outlet can be found in Mongkok. Located at Prince Edward near the Flower Market, One Dim Sum is another popular establishment that you can expect to queue for. Like with every other eating place in Hong Kong, the queue shuffles along pretty quickly as you look at the menu and decide what you’d like to eat, filling out the order form as you do. The great thing about One Dim Sum is that every dish is accompanied with a picture and is translated into several languages. The specialty dish here was the Mango Custard, but expect to find your usual dim sum favourites here too. I thought this joint was perfectly good too but I personally preferred the aforementioned chains. Still between two, we spent HKD65 each. It might come as a surprise but there are some authentically good ramen restaurants dotted all over the city, including Yokozuna, a humble (read: small) eatery tucked in a little street just off the main artery of Nathan Road. Of course, in other big Asian cities outside of Japan, I wouldn’t necessarily class ramen joints to be cheap or budget options, but these bowls are often much more hearty servings compared to (in the case of Hong Kong), the Cantonese options. I had the Original that started at HKD85. There is often a long line outside but we arrived way after lunch hour so we managed to get a seat pretty easily. Butao is a ramen chain restaurant that has sprung up all over Hong Kong, and the ramen here was in my opinion, incredibly heavy on flavour and a little more pricey to boot. I visited the one in Central also on Wellington Street, which was packed with diners waiting to fill up on a hearty bowl of ramen. Being in Central and obviously having a lot of non-local patrons, Butao was one of the places that I felt was a lot more “friendly” to foreigners in the sense of their willingness to serve in English. Like many Japanese ramen shops, you fill out your order by ticking options on a piece of paper, from the type of broth to the noodles to add-ons to drinks etc. I opted for something different this time as they’re known for their Black King option, in which the broth comes with black garlic, squid ink, minced pork, vegetables and a tantalising mixture of seasonings. I’ve had the Black option in other ramen shacks but this was the first I had with squid ink. The result was a really fragrant and incredibly tasting broth with noodles which were just the right texture for me. Mind, close to the end, I was completely stuffed and thought the broth registered a little too high on the salty scale, but for one bowl and just one bowl, that really hit the spot, though I washed it down with copious glasses of water. If you’d like your ramen a little lighter, opt for the Original Tonkotsu bowl that clocks in at HKD89. The Black King and Red King (a spicy broth with chilli powder, spicy sauce, miso, sesame oil and minced pork) are both HKD96.